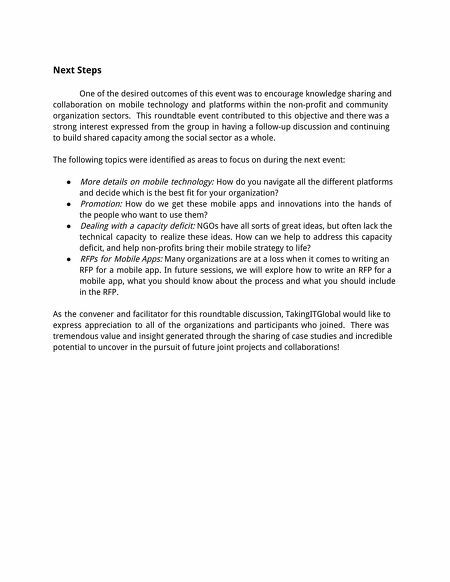 Next Steps One of the desired outcomes of this event was to encourage knowledge sharing and collaboration on mobile technology and platforms within the non-profit and community organization sectors. This roundtable event contributed to this objective and there was a strong interest expressed from the group in having a follow-up discussion and continuing to build shared capacity among the social sector as a whole. The following topics were identified as areas to focus on during the next event: ● More details on mobile technology: How do you navigate all the different platforms and decide which is the best fit for your organization? ● Promotion: How do we get these mobile apps and innovations into the hands of the people who want to use them? ● Dealing with a capacity deficit: NGOs have all sorts of great ideas, but often lack the technical capacity to realize these ideas. How can we help to address this capacity deficit, and help non-profits bring their mobile strategy to life? ● RFPs for Mobile Apps: Many organizations are at a loss when it comes to writing an RFP for a mobile app. In future sessions, we will explore how to write an RFP for a mobile app, what you should know about the process and what you should include in the RFP. As the convener and facilitator for this roundtable discussion, TakingITGlobal would like to express appreciation to all of the organizations and participants who joined. There was tremendous value and insight generated through the sharing of case studies and incredible potential to uncover in the pursuit of future joint projects and collaborations!